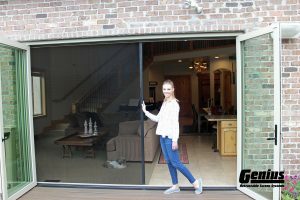 Genius Retractable Screen Systems are versatile and designed to rest in the recess area of any door or window where they virtually disappear (may also be surface mounted). Genius Retractable Screens are unobtrusive, and easy to use. Genius Screens virtually disappear when not in use! Genius Screens are small and specifically designed to rest on the surface or in the recess area of any door or window where they remain virtually unnoticeable. When not in use the screens are protected from dirt, ultra violet light and inclement weather. No more removing and storing of screens in winter! Withstands even the most extreme weather conditions. Provides a complete, secure seal from top to bottom. No gaps. Genius Retractable Screens are tough and designed to expand upon impact or accidental bumps…then return to normal position. Genius Screens prevent costly repairs and provide lasting use.